Now we’re cooking. 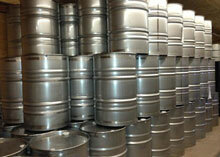 Once pumped or trucked to the sugarhouse—the heart of our operation—the condensed sap undergoes the most crucial step. 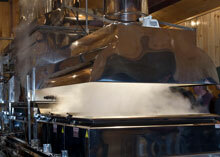 In steaming evaporator pans the sap thickens into syrup as more water boils away. Getting the syrup out of the evaporator at exactly the right moment is critical. This step, like all the others, requires careful tending. And, an expert eye and careful measurement to know when density is just right. When they are, the maple syrup is ready for the next step—passage through a high-pressure filter press that provides one final guarantee of absolute purity. The syrup is now hot packed in stainless steel drums. It’s full of the special smooth sweetness that makes Catskill Mountain Maple Syrup a pleasure of the purest kind.